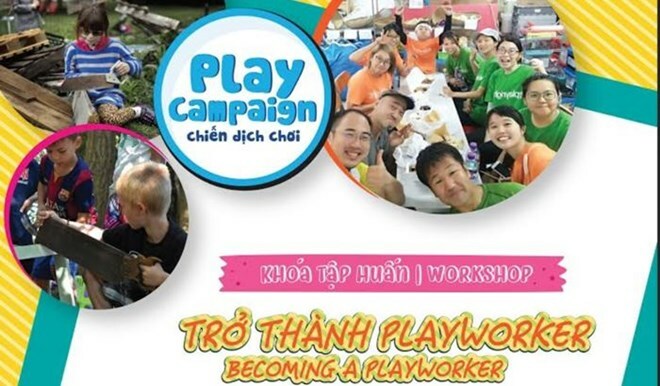 Hanoi (VNA) - A training course themed “Becoming a Playworker” aiming to raise public awareness of importance of play for children’s development was held in Hanoi on April 2 as part of activities in the Play Campaign 2019. The event was organised by the Japan Foundation Asia Centre, EcoPark Corporation and the National University of Civil Engineering. According to Quoc Dat, a founder member and communication coordinator of Think Playgrounds, most traditional playgrounds have the same equipment like slides, swings and seesaws. A creative playground model where children can build and shape their own play spaces is an “adventure playground”, he said, adding that the model helps stimulate creativity promotes intellectual development and helps kids learn life skills. The training course helped participants understand the important role of playworkers in adventure playgrounds and how to become a professional playworker who will bring practical experiences to children. During the event, Japanese experts shared their experience in running adventure playgrounds in Tokyo. Initiated by Think Playgrounds, the campaign aims to create dialogues with communities on the importance of play for children’s development.